In the Commonwealth of Massachusetts, traveling by bus is one of the most popular means of transportation available. With close to nine hundred buses running, on any given weekday around a million people travel to where they need to go in the state and to New Hampshire, Vermont, Maine, Connecticut and New York. As the price of fuel continues to go up, the number of people opting for public transportation instead of driving their own cars rises as well. Unfortunately, as the number of people using buses rises, the chances of being injured or killed in bus accidents goes up too. As a matter of fact, over two hundred and twenty people are killed annually in bus accidents in the United States. If you or someone you love has been injured in a high bus accident, or hit by a bus, give Boston Accident Attorney Neil Burns or Roshan Jain a call today. There are many different types of accidents which occur each year in the Commonwealth of Massachusetts which involve buses. A bus could roll over, for example, because the driver was going too fast for conditions, after hitting a curb, or for other reasons. A pedestrian could be struck by a bus because the bus driver wasn’t paying attention to traffic lights, crosswalk right of ways, or otherwise. A bus can collide with other vehicles in the roads, and/or could turn improperly. Equipment failure, such as brake failure, often contributes to a bus accident. It is important to find out if the driver, or maintenance personnel knew or should have known about the likelihood of that equipment failing. Distracted driving by the bus driver could cause a bus accident, as can operator error and fatigue. Weather conditions, and/or road work could also cause a bus to be in an accident. Finally, there could be an issue with a defective product in the bus, such as a manufacturing defect like sticking accelerators, etc. 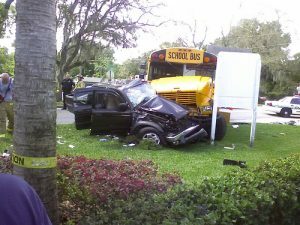 If any of these types of bus accidents has happened to you or someone that you love, give Attorney Jain a call. Often, bus accident attorneys such as the lawyers at Burns & Jain will see wrongful death or personal injury claims or suits in court because of a bus accident. In such an accident, there are a multiplicity of serious injuries that can occur. Many clients ask if their case will go to trial. There are many factors that decide this. First, many times when we file a lawsuit, the case is headed to trial, but it does not necessarily go to trial. Cases against the MBTA, for example, are more likely than not going to go into suit. If you have a strong case, you are more likely going to be in a position to settle the case. Having an aggressive, experienced attorney will explain the process and guide you through it. In such cases, if the bus driver is found to have been negligent, the driver and or the bus company may be responsible for pain and suffering, medical bills and the time loss from work. If the accident is found to have been caused by other contributors, others may be held responsible as well. It is the job of attorneys such as Neil Burns or Roshan Jain to find the reason for such an accident, and help the victims to receive compensation. He can file a claim or lawsuit on the behalf of you or your loved one who has been injured or killed in a bus accident and help you through the process of suing the responsible parties.